This is a quick guide to help you understand how to mount your StoreYourBoard product. If you have any questions, please feel free to contact us at info@storeyourboard.com. Thanks for your purchase! The majority of StoreYourBoard products are designed to be wall mounted. When wall mounting, there are a variety of factors to consider such as the mounting surface, installation hardware, and the expected load bearing weight. When possible, you should always mount your rack by screwing into your wall’s studs. Studs are the vertical wood supports inside of your walls that provide structural support for your home and a place to hang your drywall. Finding studs inside of your wall can sometimes be a tricky proposition, but luckily there are a few tools and techniques to help you out. The easiest way to find a stud is to use a stud finder tool. These are handheld electronic devices that make finding studs very easy. If you don’t have a stud finder, then you can still find studs but it’s a bit harder. One of the most helpful tips is that studs are typically spaced 16” apart on center. This means if you can find one stud, then chances are good that there is another stud 16” to the left and right of it. One technique of locating studs without a stud finder is to look for clues in the trim. Trim is supposed to be nailed into studs, so if you can find evidence of nails (i.e. painted over nail heads or small holes) then chances are you’ve found a stud. Another way to locate a stud is looking for electrical switches or outlets. Light switches and outlet boxes are typically screwed into the side of a stud, so this should help you pinpoint where your studs are. Drywall installation should only be done if there is absolutely no way to mount into your wall’s studs. Also, drywall installation should never be used to hold anything greater than 10lbs! Drywall is simply plaster plus paper, so it is not designed to take structural loads. If you must install into drywall, then you should use some sort of drywall anchor and not solely wood screws. Drywall anchors are little devices that help make screwing into your drywall safer. 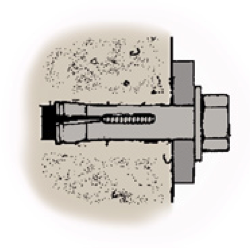 Drywall anchors come in a variety of shapes and sizes, but their purpose is the same. They are designed to help distribute the load on your drywall making the screws less likely to be pulled out. 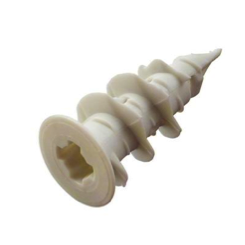 StoreYourBoard provides the threaded “EZ-anchor” style drywall with select products. This anchor is easy to use because it can simply be screwed into drywall with no special tools. If you’re looking to wall mount your StoreYourBoard product into something other than a traditional interior wall, then you’ll need to do things a little differently. Unlike most interior home walls, brick and plaster don’t have convenient wooden studs to screw into. The recommended way to mount into brick and plaster is using dedicated anchors like you would for drywalls. Go to your local hardware store and you should find specialized anchors (i.e. masonry anchors) for your specific wall material. In most cases, you’ll want to drill into the mortar because it is less brittle and easier to repair than brick or concrete. Ceiling mounting your StoreYourBoard product is very similar to wall mounting in that you must consider the mounting surface material, installation hardware, and expected load weight to properly install your product. 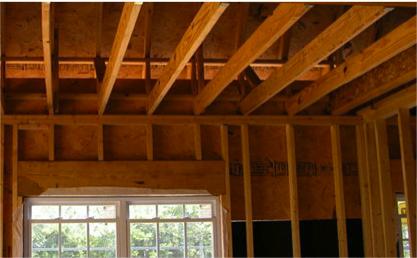 Many people know their walls have studs, but not everyone knows that there are also beams or “studs” that are in the ceiling. These serve the same purpose as wall studs in that they provide structural integrity to your home and provide a way to hang drywall. If you plan to ceiling mount your product, then you MUST screw into a ceiling beam. Unlike wall mounting where you have the option of using drywall anchors, you cannot use drywall anchors for ceiling mounting. If your ceiling is unfinished (like in some garages), then locating the ceiling beams is trivial. If your ceiling is finished with drywall, then you can locate a beam in the same way that you locate a drywall stud. Similar to ceiling mounting in these materials, you’ll need to install using specialized anchors. For instance, if you’re mounting into brick then you’ll need masonry anchors to ensure a proper installation. In most cases, you’ll want to drill into the mortar because it is less brittle and easier to repair than brick or concrete. There are 2 main things that should be considered when determining your rack arm spacing: number of boards stored and wall stud location. If your rack is designed to hold only one board, then determining how to space your rack’s arms is pretty straightforward. If your rack is designed to hold multiple boards, then you will need to accommodate all of the different length boards you plan to store. For mounting a single board, we recommend using the rule of 3rds or 4ths. What this refers to is where the rack should support your board relative to the length of your board. For example, if your surfboard is 9ft long and you used the rule of 3rds, then you would want the rack arms to land 3ft in on each side of your board. 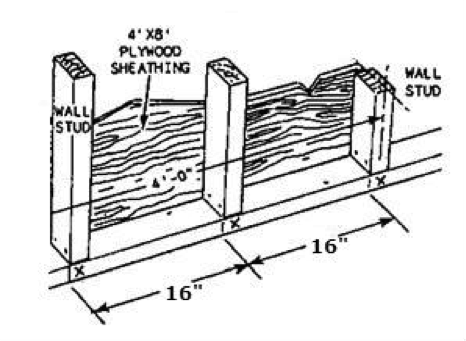 As another example, if your board was 6ft long and you used the rule of 4ths, then you would have the rack arms land 1.5ft in on both sides of your board. If you have a rack designed to hold multiple boards, then you’ll need to do a little more planning than a single-board rack. The key thing to remember on a multi-board rack is that you need to space the rack arms narrow enough to accommodate your shortest board. 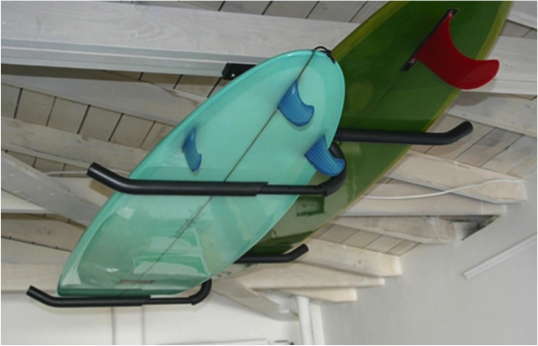 For instance, if you have shortboard and longboard surfboards, then you’ll need to make sure that the rack arms are close enough to fit your shortboard. Another thing to consider when spacing your rack arms is where your board’s bindings/fins/boot etc are going to land. Depending on how you store your board and what type of board you have, you’ll want to make sure these features don’t align with the rack arm. Of course, one easy solution is just to slide the board over a little, but this will offset the symmetry and it won’t look as cool! The last thing to consider is that mounting into a stud or other substantial surface is mandatory due to the increased weight of a multi-board rack. This ads a little to the challenge because you’ll need to find a set of studs close enough to fit your shortest board, but not so close that it makes your longest board unstable. Mounting into your ceiling is really no different than mounting into your wall when considering the rack arm separation distance. For instance, you’ll still want to consider where ceiling beams are, the length of your board, and whether or not your rack holds multiple boards. The one difference we propose is using the rule of 3rds instead the rule of 4ths. This will provide a little more “safety factor” that will ensure little bumps into your board don’t turn into catastrophic damage! Have questions? Please feel free to contact us at info@storeyourboard.com. Please use this guide to help with your installation but understand that StoreYourBoard (SpireLLC) is NOT responsible for improper installation or damage.